Those with spinal cord injuries (SCI’s) know that medicine still has a long way toward a successful solution for their injury. Spinal cord injuries often occur as a result of trauma, such as a fall or gunshot wound. The initial physical compression and loss of blood supply to the spinal cord, followed by secondary edema and swelling cause a death of the spinal nerves which control our movement. In short, this type of injury usually takes away a person’s ability to walk and stand on their own. SCI’s are normally classified in ASIA grades from complete (A) to normal (E), with incomplete injuries in between. Complete injuries involved complete loss of movement and sensation below the level of injury, while incomplete injuries maintain some preservation of sensation or motor control. Unfortunately, the rate of spontaneous recovery for those with complete injuries is low, while incomplete injuries have a slightly better success rate of recovery. One project working toward a solution for spinal cord injuries by combining technology and rehabilitation is the Walk Again Project. 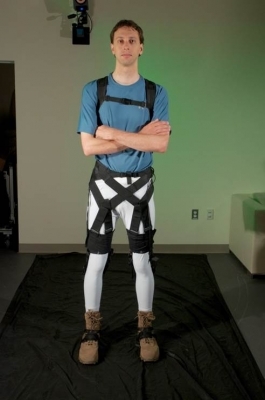 Working toward a protocol for SCI recovery, this group has recently published research combining virtual reality and robotic assistance with variable gait training. And, it has shown promise of providing some recovery even for paralyzed individuals with complete SCI’s. In the publication, the project demonstrates a partial return of neurological function in complete SCI’s by combining several methods of treatment. As the person controlled movement via a robotic exoskeleton with their brain using virtual reality for guidance, they also received some physical feedback from their environment. This physical feedback was applied to areas such as their feet or forearms in response to certain movements. The results of this involved, year-long training are novel and incredible. People with previous complete loss of muscle and sensory function were able to regain some motor control, sensation, and proprioception after training. This is a novel publication by the length of the study and methods of guidance which lead those with SCI’s back toward recovery. The combination of brain machine interface, robotics, and rehabilitation provides a groundwork for future treatment options. Each development in the exoskeleton industry seems more amazing and unbelievable, pushing users into a new frontier of possibility for motion. 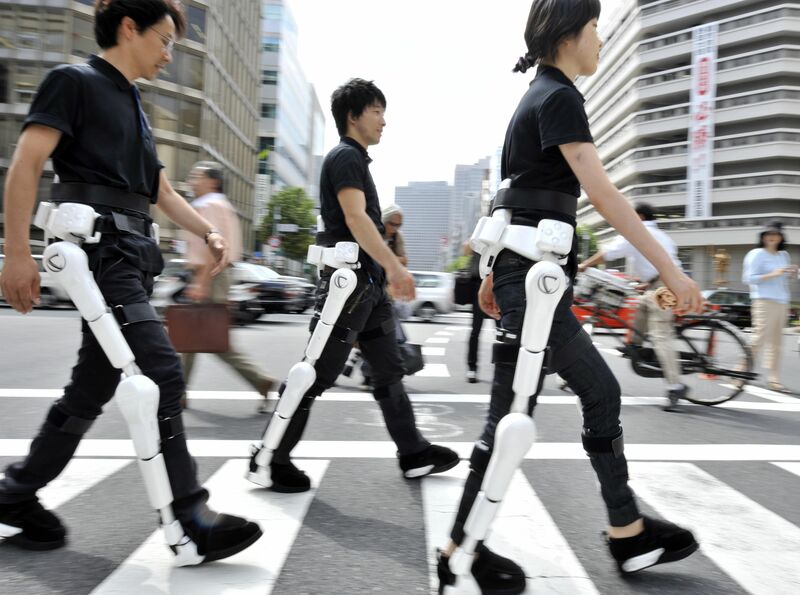 HAL (Hybrid Assistive Limb) by Cyberdyne, coined as “The world’s first cyborg-type robot,” is a thought-driven exoskeleton which provides gait assistance for its users, among other functions. Designed for both industrial use and motor relearning after neurological injury, HAL provides strength and facilitates feedback for those that need extra power with gait. Cyberdyne explains HAL’s function from thought to movement in 7 steps. The process is initiated when the user thinks about the movement. In relearning movement after an injury, to include this thought component to the movement process is vital. In an uninjured person every voluntary movement begins in the motor cortex with thought, where the movement signal is ultimately sent to a muscle to produce movement. The way that HAL replicates this process is by attaching sensors on the wearer’s skin which receive these bio-electric signals (BES) from the brain. Upon receiving these signals, the body begins to move, causing the device to move as well, thereby assisting and adding power to human motion. We are getting closer and closer to a device that will free those with spinal cord injuries, and other neurological injuries, from the restraint of a wheelchair. HAL is an amazing, well executed device. Please visit the site for more information and sales inquiries. HAL has multiple variations of its product, including lumbar support for lifting and a cleaning robot. A lightweight wearable robot which subtly assists with human movement? The amazing innovation of wearable technology cannot be achieved without intelligence, countless hours of work, and years of research by those behind the products. Boosted by a recent DARPA grant, Harvard’s Wyss Insititute is developing a Soft Exosuit to assist with walking with the use of textiles and wearable sensors. While not yet a completed product for the market, it is already clear how this wearable robot can potentially change the lives of those with neurological disorders, muscle weakness, the elderly, and those that are fatigue-prone in professions such as the military and first responders. The components of this product are amazing, especially in their consideration to avoid interference of the device with the user. Elastic textiles that align with certain muscle groups and transmit forces to the body to assist with natural, synergistic movement during gait. Because the textiles are elastic and are unable to measure angles at joints (as rigid components do normally), wearable sensors at the hip, calf and ankle monitor forces and changes in movement. The idea is to provide assistive torque at the joints to mimic normal muscle activity when needed. The sensors track the changes in movement to monitor the types of activities of the user, such as walking or running, to assist with the diversity of everyday activity. 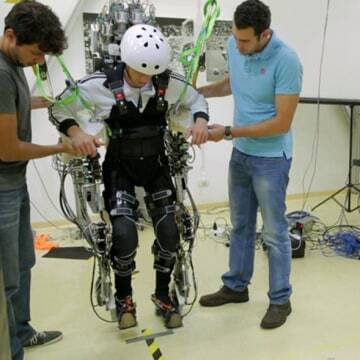 Something especially interesting about the Exosuit is how closely it works with human physiology and biomechanics during gait, including the passive movement of the limbs during walking. Because the functional textiles stretch, they can closely align with muscle groups and assist movement without letting the components interfere with what is natural for the body. Being permanently confined to a wheelchair not only limits you for health reasons, but wheelchairs are also a huge physical barrier to traveling between locations. Even if a target destination is coined ADA accessible, logistically getting to and from a location can have so many barriers that it may not be worth the trip. Constantly relying on others for assistance, not being able to speak at eye level, the physical impact of constantly sitting are some of the problems those that are confined to a wheelchair must experience. Developed a couple of years ago but finally being released for sale on the market sometime this year, Tek Robotics has developed a robotic mobilization device that allows an individual to independently stand, and then mobilize them to a location that may not be wheelchair accessible. Each device supports a person from behind and gently pulls them into standing position, all without the assistance of a second individual. Instead of throwing the body forward as needed to heave someone out of a wheelchair, this battery-operated devices uses a gas spring to help suspend a person in a standing position. The dimensions are thin enough to fit through a regular doorway (it occupies one third the width of a wheelchair, states the website) but also designed for balance even with the narrower base.